For much of recorded history, skin color has been loaded with powerful social meaning. Skin color plays a major part in how we define race. It also plays a significant role in racism. New studies of the genetics of skin color, though, have begun to shed light on how wrong those assumptions about the relationship between race and skin color really are. The genetics of skin pigmentation appears to be far more complex than previously thought. Skin color is a heritable condition, meaning it is trait passed down to you by your parents. But skin color is not determined by any one single gene, and how those genes interplay to make you look like you is by no means straightforward. In a new study of indigenous southern African people published Thursday in the journal Cell, researchers from the Broad Institute of MIT and Harvard, Stanford University, and Stony Brook University report that the number of genes involved in skin pigmentation increase in number—and therefore also complexity—the closer they reside to the equator. 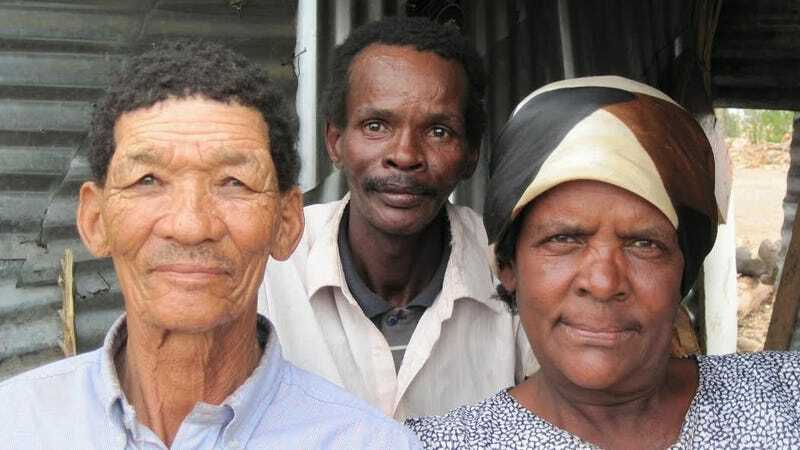 The researchers spent seven years with the KhoeSan people, interviewing them, recording details such as height, age, gender, and using what’s called a reflectometer to quantitatively measure skin color. All told, they collected data for about 400 people. They then genotyped each sample, looking at hundreds of thousands of spots on the genome to identify markers associated with pigmentation, and sequenced those regions. Genetics, generally, is a comparative science, so next they compared the new data to a dataset that was comprised of 5,000 people from across the globe. What they found undercuts a common view about how genetics and skin color works. The prevailing theory reflects what you probably imagine when you think of how skin color differentiates across the globe: People closer to the equator are darker, and the further away you get, the lighter in pigment. The new data, though, suggests a picture that is far more complex. In the far north, they found, it’s generally true that the farther north in latitude you go, the lighter the complexion. But closer to the equator, things get all mixed up. Something called “stabilizing selection” comes into play, and a greater number of genes begin to affect skin color, resulting in an increased chance of variability. The scientists were only able to attribute about 10 percent of that variation to genes already known to impact skin color. The work also resulted in new insights into particular genes. A mutation in one gene, the pithily named SLC24A5, is thought to have cropped up in Europe some 10,000 to 20,000 years ago. But in the KhoeSan population, it appears much more frequently than would be expected, suggesting it either actually first arose in the KhoeSan people, entered the population through mating thousands of years ago, or perhaps began to show up more frequently over time because it produced some genetic advantage to the KhoeSan people in particular. Another study published this fall looked at the evolution of gene variants associated with skin color and similarly concluded that past assumptions about genetics and skin color have been just plain wrong. In that study, researchers zeroed in on eight genetic variants in four regions of the human genome that strongly influence pigment. They found that those genes are shared across the globe. One gene, for example, played a role in lightening the skin of both Europeans and hunter-gatherers in Botswana. That gene, they found, predated Homo sapiens, evolving in a different species of human in Africa some 300,000 years ago. The conclusion of all this is that color lines are, in essence, meaningless. Our skin color is the result of many, many different genes which work together in different combinations to produce different colors of skin. Many of those genes are shared across racial, cultural, and geographic boundaries.